City crews work at all hours and in all weather to repair, improve and maintain Portland's infrastructure. (April 8, 2019) Rain, wind, snow or sun – the City of Portland’s crews are out on city streets every day of the year working to repair, improve and maintain Portland’s street and water infrastructure. 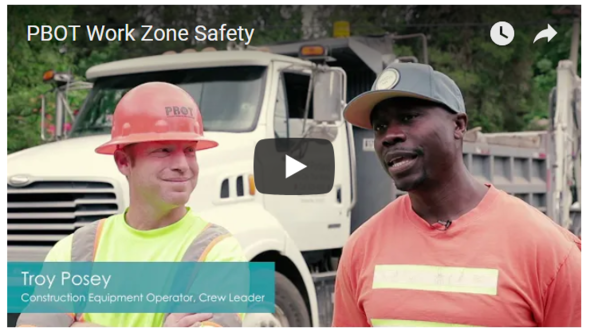 On the first day of National Work Zone Awareness Week, the Portland Bureau of Transportation (PBOT), the Portland Water Bureau, Portland Parks & Recreation, and the Bureau of Environmental Services (BES) remind people to take care when traveling through work zones. Obey all speed and warning signs. Work zone signs are for anyone traveling through – whether the person is walking, biking, rolling or driving. They are there for your safety and will help prevent a collision. SLOW DOWN. Speed can be deadly. Alone or in combination with other factors, speed is a major factor in 47% of Portland’s traffic deaths. Be alert. Put down your phone and pay attention to the road conditions ahead of you. Carefully move over. When possible give workers more room between them and your vehicle, but do not veer into an oncoming traffic lane. Keep your distance. Rear-end crashes are extremely common in work zones – maintain extra space between you and the person in front of you at all times. Stay clear of construction vehicles. Heavy vehicles travel in and out of the work areas and can make sudden moves. We know it’s fun to see our machines at work, but please keep a safe distance from the work zone if you plan to watch. Expect delays and be kind. Our goal is to get you through our work zone safely, while also completing our street improvements in an efficient manner. We appreciate your understanding. Click or tap to view the video. As the construction season begins, crews will be out in neighborhoods across the city filling potholes, restriping roads, repairing street signs and clearing catch basins as well as building curb ramps and sidewalks, grinding and paving roads and so much more. Thank you for your patience as we do this crucial work to keep our city moving and feel free to show your appreciation to our crews with a thumbs up or a wave the next time you pass by. National Work Zone Awareness Week runs from April 8-12, 2019. 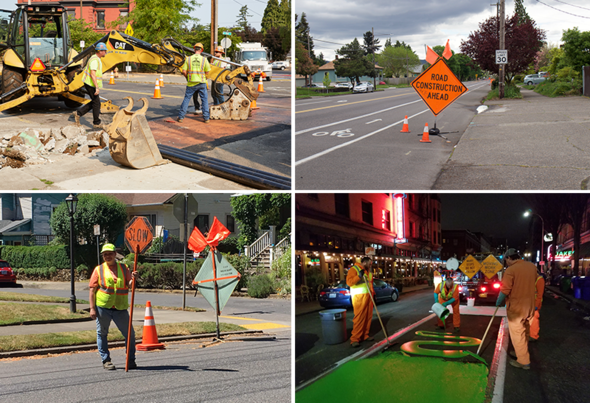 Work zones play a key role in maintaining and upgrading Portland's roadways, water and sewer infrastructure and more. Unfortunately, daily changes in traffic patterns, narrowed rights-of-way, and other construction activities often create a combination of factors resulting in crashes, injuries, and even fatalities. These crashes also cause excessive delays, especially given the constrained driving environment. Recent statistics from the National Highway Safety Administration’s Fatality Analysis Reporting System (FARS) show there were a total of 158,000 work zone crashes total in 2016 across the United States—of which 42,000 were injury-involved crashes that resulted in 61,000 injuries. On average, in 2015, a work zone crash occurred once every 5.4 minutes. The Portland Water Bureau has delivered drinking water from the Bull Run Watershed to customers’ faucets since 1895. Our Maintenance & Construction crews are ready to respond to emergencies, including water main breaks, 24-hours a day, seven days a week. On average, crews respond to 200 main breaks a year. For questions on water quality, contact Water Line, 503-823-7525. Customer Service is available to answer questions about billing and financial assistance by phone from 8 a.m. to 5 p.m. Monday through Friday at 503-823-7770, and in-person at our Walk-In Service Center, 664 N. Tillamook St., from 7:30 a.m. to 4:30 p.m. Monday through Friday. To learn more about your water system, visit portlandoregon.gov/water; follow us on Facebook, Twitter, and Instagram; or subscribe to our newsletter: portlandoregon.gov/water/EmailNews.